Author: Rolfes Robert Reginald Dhlomo †. Translated by: Peter Sulzer †. With an epilogue by: Peter Sulzer †. This book contains the first translation of Rolfes Robert Reginald Dhlomos biography of Shaka, the most famous king of the Zulu (1787–1828), into a European language. The original was published in Pietermaritzburg in 1937. Shaka is still remembered nowadays by the Zulu as the king who forged the first Zulu empire, stretching from Transkei to modern Moçambique. He is as well known for his limitless ambition for power and cruelty as being an ingenious military leader and statesman open to reforms. Shaka’s campaigns caused widespread upheavals and enduring warfare and in southern Africa, which in turn made possible for the Trekboers, retreating from the Cape Colony before British dominance, to take possession of the depopulated lands. His death at the hands of his brothers Dingane and Mhlangana can be explained as a result of Shaka's oppression. 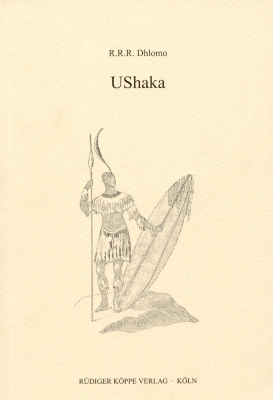 In the epilogue the translator has also provided a comparison between the two different Shaka biographies by Dhlomo and the Sotho author Thomas Mofolo.